We made it easy for you to replace your ParaChat social chat room. RumbleTalk is already serving over 500,000 chat rooms. It takes two minutes to add your own chat. Powering 500,000 group chat around the globe. RumbleTalk is a stylish group chat rooms platform for websites, events and community discussions. Let your audience, team and users chat together to boost your website engagement. RumbleTalk social online group chat features provide the complete solution for communities and events. Choose a stunning online group chat theme from our gallery, or style your chat room however you want. You can use our intuitive advanced design tools or create your own chat theme using CSS. A RumbleTalk hosted chat service will take the burden off your servers. We use the latest cloud technology to ensure a fast, reliable chat room experience wherever you are. 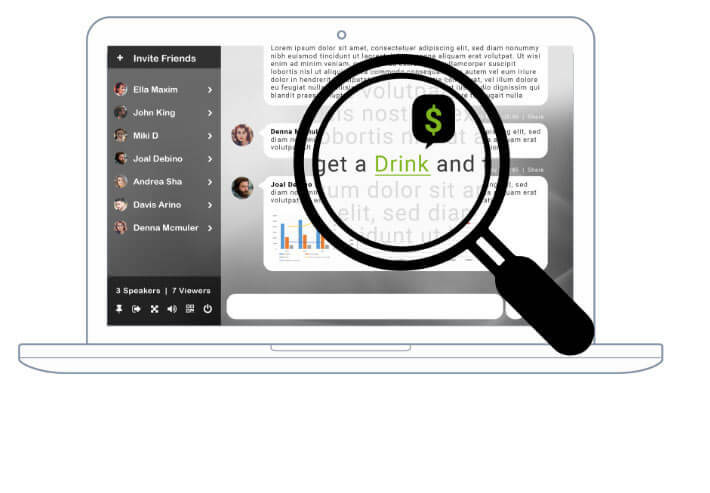 RumbleTalk InTEXT highlighted word ads will transform the way you earn from your chat. Specific words can be automatically highlighted and linked to anywhere in the net, allowing you to direct your fanbase and audience to your affiliated partners. Enable paid chat and you can charge for entering a chat per minute or by subscription. Maximize your earnings with RumbleTalk chat. Works with Paypal, so your audience can easily login and pay. 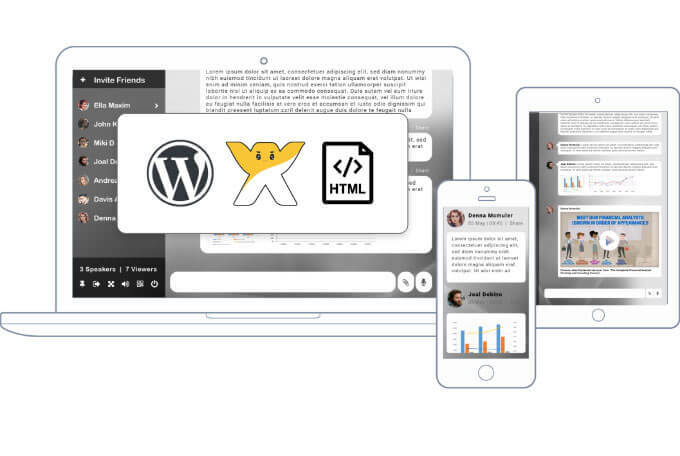 RumbleTalk InTEXT highlighted word ads will transform the way you can earn from your chat. Specific words can be automatically highlighted and linked to anywhere on the net, allowing you to direct your fanbase and audience to your affiliated partners. Create one or several rooms. RumbleTalk's advanced admin panel helps you manage all your rooms. Add different rooms to different areas of your site. Add different rooms to different websites (domains). Embed the same chat in several locations. Don't have a website? No problem. You can share a direct group chat link with your group. RumbleTalk group chats are hosted on RumbleTalk servers. This means you won't have to install any software or worry about bandwidth, server performance, or maintenance. RumbleTalk chat can be used for group discussions and/or for private discussions. Group chats can be open for the public (social chat) or restricted to members only. Use it on the fly for ad-hoc queries, or as part of a more complex logic. The RumbleTalk HTML5 group chat platform can be added to any page. It is fully responsive and will fit itself to the space you give it. 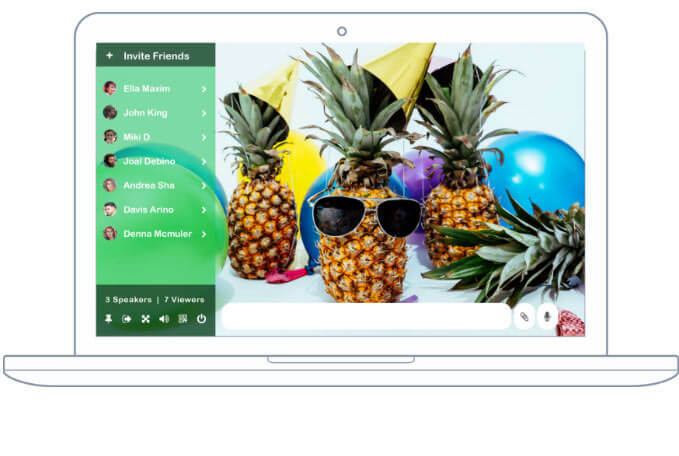 We've designed our group chat to seamlessly and beautifully display on everything from pc, Mac, and smart phones to big screens and smart TVs. It can also be embedded as a floating icon in the left or right lower corner of the window. RumbleTalk group chat can be designed to fit any style. Our admin panel allows easy customization options for everything from fonts to background images. You can also choose a premade design from a vast library of premade themes. You can use a theme as is or tweak the settings to truly capture your desired look. For more advanced users, RumbleTalk group chat allows full CSS customization for both (and separate) web and mobile browsers.  You can even choose custom notification sounds�notifications for new messages, users, calls, and more can all be customized. The same group chat window can be placed across many websites or pages and the conversation is automatically synced. This means your customers can browse your content while remaining engaged in the online community. RumbleTalk group chat enables participants to chat as a group and privately. Private conversations can be text, audio, or even video calls. 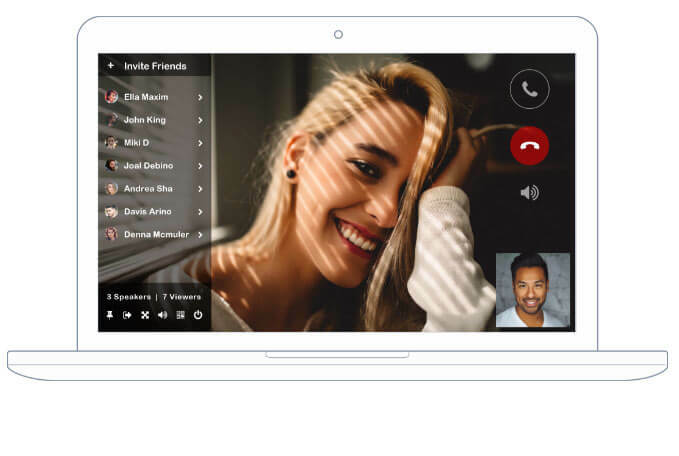 We've implemented the latest Google WebRTC technology, which means your users won't have to install any software to make private audio and video calls. 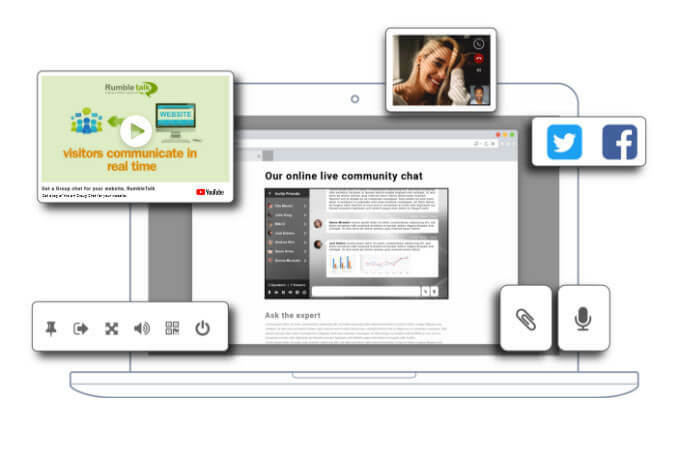 Enrich your conversation with images, voice messages, and YouTube videos. Administrators have several tools to effectively moderate group chats. Ignore users - any participating user has the ability to ignore another user's private & public messages in the chat. If your users are created in the users management area, or logged in with their Twitter or Facebook account, their profile information will show when clicking on a user name during a chat conversation. We've taken care of security too. RumbleTalk uses SSL/TLS security to protect your conversations and users' information. A RumbleTalk group chat history can be automatically archived for three months. During this time, you can easily export your conversation history as an HTML file. and several paid plans with more features, and support.